Oakville Little League has adopted a Fair Play philosophy that emphasizes there are two considerations more important than winning: that kids play Little League to participate and to enjoy the game. This notion of Fair Play is a universally understood concept, which underpins all the house leagues of Oakville Little League. Without fairness, the game is devoid of any meaning or purpose. Worse still, it can be a detrimental experience for its participants. The Oakville Little League Fair Play philosophy is also one of respect for others, and respect for the game. It is an agreement, between all of those involved in Oakville Little League (players, coaches and parents) on the values and lessons that we want the Little League experience to teach our children, and ourselves. 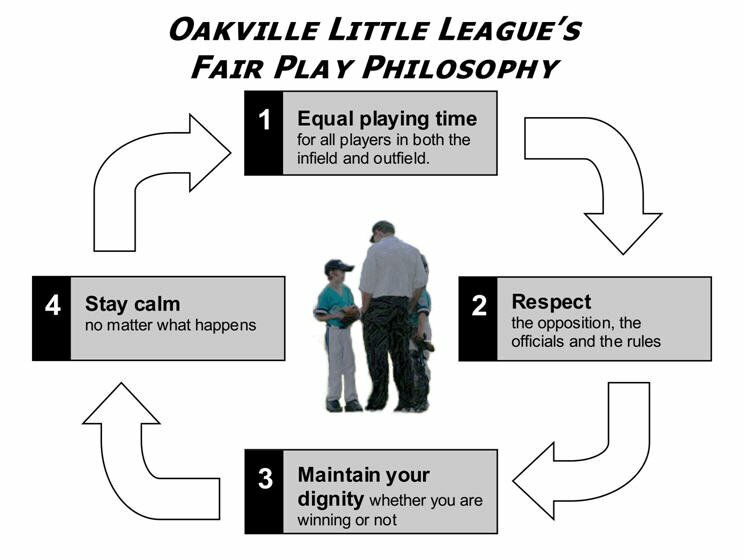 The Oakville Little League Fair Play philosophy starts with the simple rule that in every game, in all divisions, regardless of skill level, every player must play equal time in the infield and in the outfield. Playing fair also has to do with respect and making choices. As we interact with each other in a game, or as spectators, we must regularly consider and define what we think is right and what is not. As our children interact with each other in games and practices, their ability to make good choices about fair play issues matures along with their ability to think and learn about what makes for a rewarding and fulfilling life in society. At all times everyone involved is expected to respect the opposition, the officials and the rules of the game. Bending the rules and foul play are unsporting and ruin the enjoyment for all involved. This type of behavior by players, coaches or spectators will not be tolerated. All participants in the game are expected to maintain their dignity whether they are winning or losing. Coaches and parents are expected to lead by example. If you are winning, don’t run up the score. Manage the game so that both you and your opponents can maintain their dignity. The final and probably most important aspect of the League’s Fair Play philosophy is that everyone remains calm at all times no matter what happens. Players, coaches and umpires are human and errors are going to occur. If everyone stays calm the game is much more enjoyable for all involved. Most important in this respect is that abuse of players and umpires will not be tolerated. Remember after all, it is just a game played by young people, officiated by volunteers and that every team makes the playoffs. Everyone has a role to play in fostering a fair play and fun environment for our children. Play your part – play fair.